Sending marketing emails can sometimes feel like putting messages in bottles and tossing them in the ocean. You hope the message will survive shark attacks and storms to reach the right person—but deep down you know the odds aren’t in your favor. 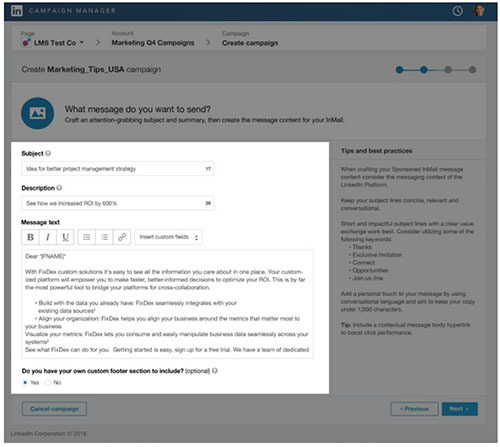 LinkedIn Sponsored InMail helps marketers break through the limitations of traditional email marketing by delivering personalized messages within the uncluttered LinkedIn inbox environment. 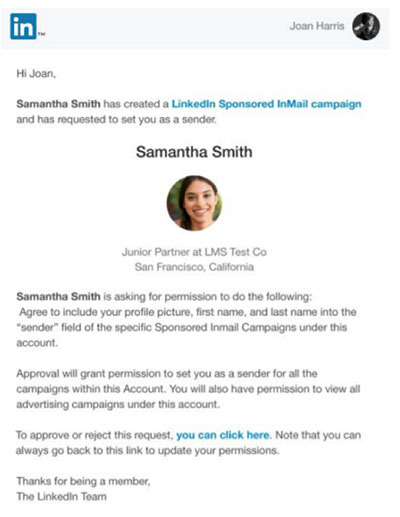 What’s more, Sponsored InMail will only reach members only when they are active on the LinkedIn site. 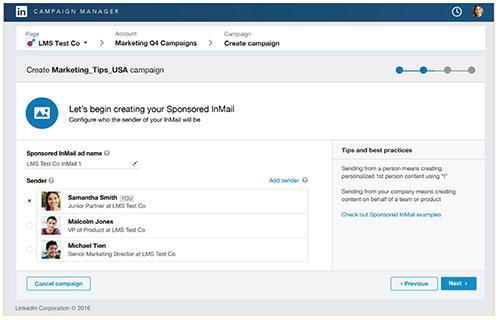 Follow this visual guide to get started with your first Sponsored InMail campaign on LinkedIn. Need an even more visual guide? Check out our LinkedIn Sponsored InMail course on Lynda.com, hosted by our Senior Product Marketing Manager Irina Skripnik. 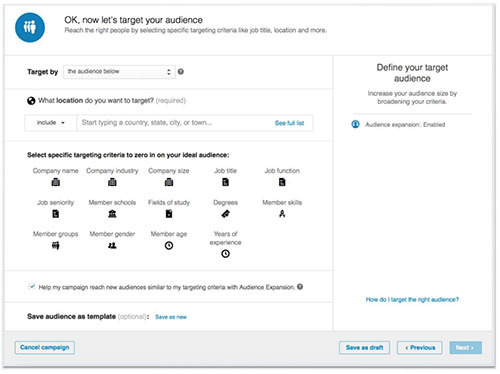 Here’s a quick overview of LinkedIn’s messaging experience. 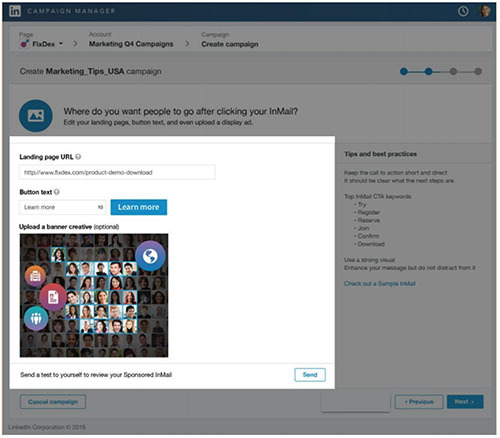 Campaign Manager is the hub for all of your LinkedIn marketing campaigns, including Sponsored InMail. You can get there from your profile. Or just go to linkedin.com/ads. Select a memorable name for your account and your local currency. If you have an existing Company or Showcase Page, you can link it to the account here. Then you will be prompted to name the campaign. Choose a descriptive name that will make sense to everyone on your team. The sender plays a big role in representing both your brand and the reader’s experience with your InMail message. By default, you can select yourself as a sender. Alternatively, you can set up another sender but you must be a first degree connection with person you’d like to add as a sender. 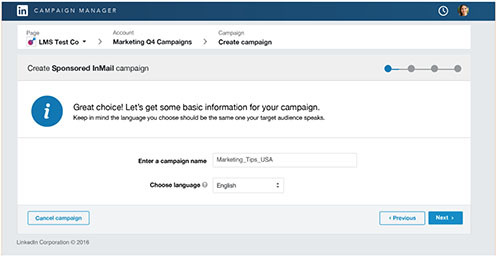 This generates a message to let your senders know what being involved in the campaign means, and opens a dialog for them to approve or deny the request. You can see who has approved your request under Manage Permissions. If you remove someone as a sender, any campaign using that person as a sender will be suspended. If you want to get started right away, it may be easiest to use your own account as the default sender, so you aren’t waiting for permissions. 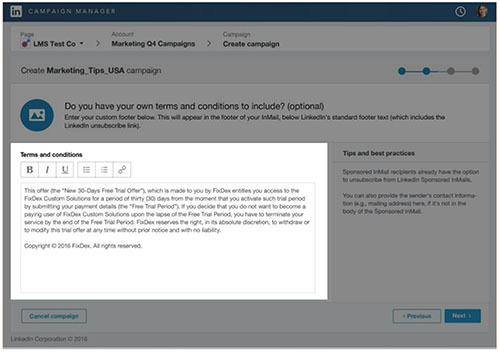 If your InMail includes an offer, coupon, or giveaway, you can add terms and conditions here, too. You can choose to include a banner image with your InMail. The optimal size is 300x250 pixels. If you choose not to use your own image, ads from other advertisers may appear in the slot. You’re almost there! 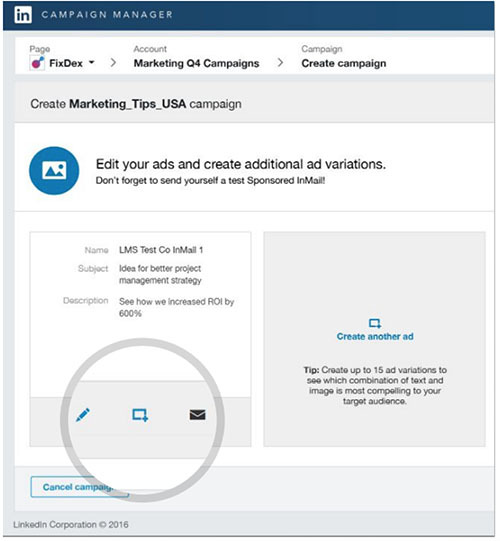 From this screen, click the envelope to send yourself a test version of the message, and the middle icon to duplicate the campaign to set up A/B tests. Campaign Manager will estimate the size of your target audience based on the criteria you apply. It’s best to aim for around 100,000 to ensure scale. Learn more about targeting the right InMail audience. 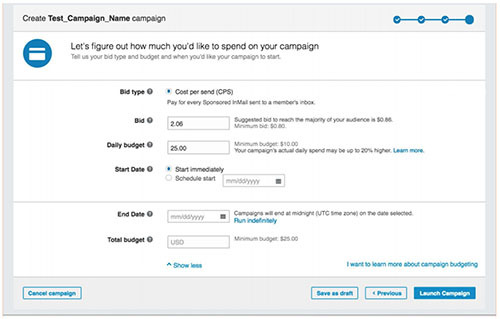 Campaign Manager will suggest a bid range to reach your target audience. You will be bidding against firms attempting to reach a similar audience. It’s a good idea to bid at the high end of the bid range. Here’s a quick guide to bidding on InMail. Since the winning bid is determined via second-price auction, you will only pay enough to beat the second-highest bidder. Once you set bid and budget, you’re ready to launch. You can launch the campaign immediately or schedule for a future date. Congratulations! Now you’ve taken your message out of the bottle and delivered it directly to your target audience. To learn more about Sponsored InMail, take our free LinkedIn Sponsored InMail course on Lynda.com. Ready to put this guide into action? 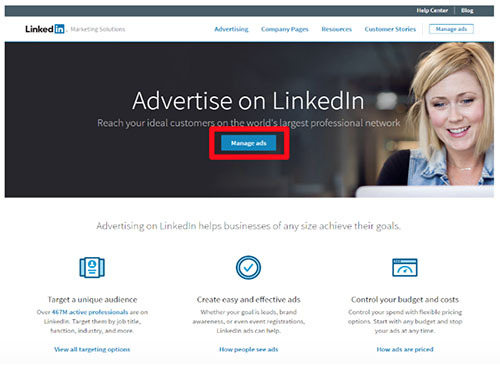 Head to linkedin.com/ads to get started. To keep pace with the latest on LinkedIn and other digital marketing, subscribe to the LinkedIn Marketing Solutions blog today.